Allen and Ryan are back talking about the X-Men titles released last week. The guys take some time to discuss estimated X-Men sales from June and details on X-Men Marvel Legacy previews. The guys are joined by website contributors Anthony and Rob to discuss the books too! Plus Fastball Tweets from the X-Men Monday Thread. Thanks for listening! This week the guys review Logan. Is Hugh Jackman’s farewell performance as Wolverine the greatest comic book movie of all time? Or is it too dark and gritty for a superhero movie? These questions and more are explored as the guys review Logan, enjoy! Be warned spoilers ahead! Super Podcasto Magnifico! Ep. #251: Logan Movie Review! On this podcast we review Logan. Have you heard of it? Our shirts are off for this one. We need it for our tears. Spoilers ahead. Listen in! What did you think of Logan? Head over to our podcast Facebook page and let us know. Check out Brawler #1 and #2 on Kickstarter now! This week, we wrap up our coverage of The Eighth Day with The Juggernaut:The Eighth Day #1, which finds our hapless heroes stuck to a giant golden phallus!! As if that’s not enough, we have a magically appearing wheelchair, and a machine that can still (apparently) be operated after 20 pages of the Juggernaut ripping it apart. Oh, and Thor’s in it too. This week we cover Part 3 of The Eighth Day with Peter Parker: Spider-Man #11! Two new heroes join this very crowded story, but can Spider-Man and Professor X help destroy..the God Machine?? The franchise culminates yet again in the time traveling sequel/prequel… X-Men: Days of Future Past. Foshkos wants to know your opinion on the X-Men: Days of Future Past trailer. 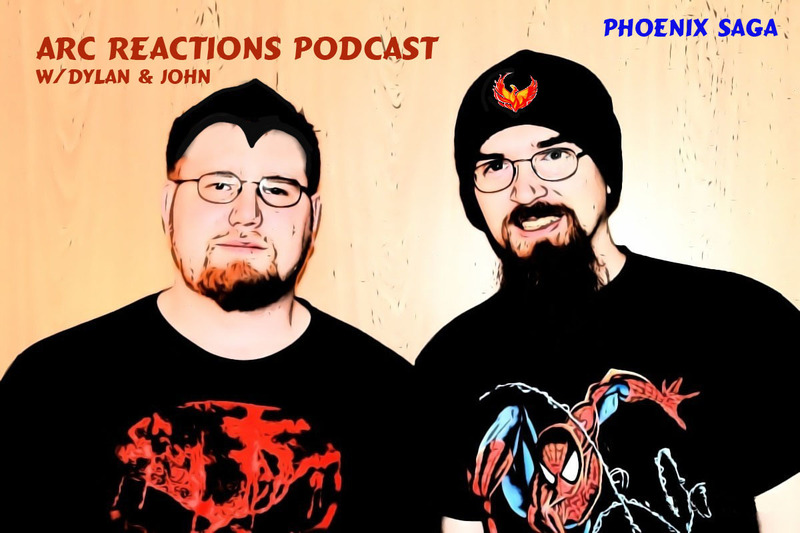 Dylan and John discuss the Phoenix Saga and Dark Phoenix saga from X-Men 101-108 and 129-138. Marvel Comics published these stories in 1976 and 1980. Did Hellfire (Mastermind) manipulate Jean to release the Dark Phoenix? Our next podcast will be covering A Death in the Family and Killing Joke, both Batman tales. That podcast will be uploaded on July 28th. We will be updating on a biweekly schedule on Sundays. The next episode will go up on June 30, 2013. In this episode of the Arc Reactions Podcast, Dylan and John discuss the 19-issue mini-series from Marvel Comics entitled Avengers Vs. X-Men. The podcast has a couple explicit words in it. We have decided that all future podcasts will be kept PG in order to allow all listeners to enjoy the content. How this led into Marvel Now. We would love to hear from you with arc suggestions as well as feedback on the show.